A young Canadian woman is undergoing treatment after being found beaten unconscious in a hotel in Mexico's Mazatlan resort region. Consular officials are in contact with the family of a young Canadian woman who was reportedly beaten unconscious in a hotel in Mexico's Mazatlan resort region and are pressing for an investigation into the incident, according to a statement released Sunday. "Our thoughts are with the badly injured Canadian and her family during this difficult time. Our officials in Mexico have provided, and will continue to provide, consular assistance to her and her family," said John Babcock, spokesman for Minister of State of Foreign Affairs Diane Ablonczy. Mexican federal police told CBC News on Sunday that the woman, reportedly in her 20s, was found lying in an elevator early Saturday. The police officer would not provide his own name, nor reveal details about the victim's age or identity. Mexican media reports that the woman was found at the Hotel Riu in Punta Cerritos and is said to be in serious condition. Police statements say another tourist was trying to enter the elevator and discovered the woman lying on the floor in a pool of blood, according to a noroeste.com report. The report said investigators suspect she may have been assaulted in a hotel room, dragged down the hall to the elevator and then abandoned. How closely do you pay attention to travel advisories? Take our survey. Noroeste further reports that the victim is thought to be between 25 to 27 years and about five feet eight inches tall. She is described as having brown hair and a light complexion, and was wearing a hotel wristband on her right hand when she was discovered. The news outlet also reports that the woman was rejected by two private clinics before finally being taken to a hospital. 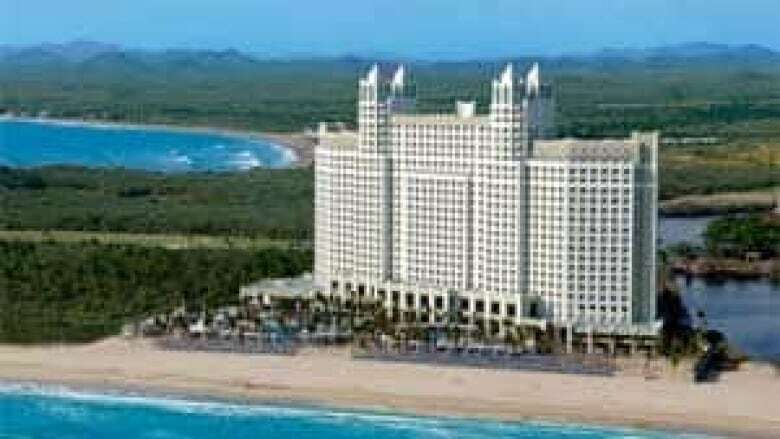 The Hotel Riu Emerald Bay in the Mexican resort town of Mazatlan has several five-star ratings on travel websites, and is a popular travel destination for both Canadian and American tourists. The attack is the latest in a series of violent incidents involving Canadian visitors to Mexico in recent weeks. Two Canadian men were shot dead in separate incidents earlier this month, while the body of a Mexican-born University of British Columbia student who disappeared in December was also found stabbed and strangled with her hands tied behind her back near a Mexican beach. P.O.V. | How closely do you pay attention to travel advisories?